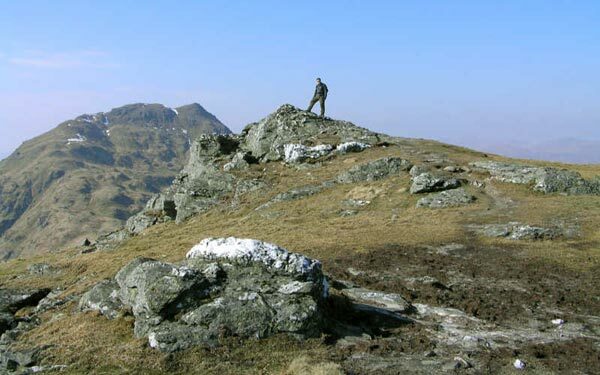 Beinn Tulaichean overlooks Inverlochlarig to the S and is most easily accessed from Inverlochlarig Farm at the head of Loch Doine near Balquidder. Beinn Tulaichean is effectively a peak on the SE ridge of Cruach Ardrain. 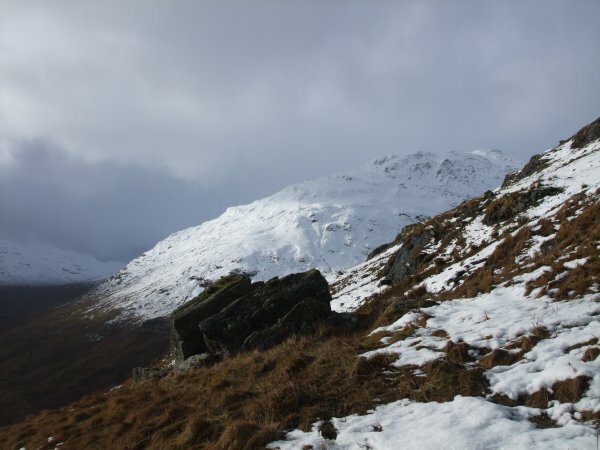 Beinn Tulaichean has three ridges, the main ridge runs NW to Cruach Ardrain and there are short ridges SSW and ESE, the latter facilitating a direct ascent from Inverlochlarig. The top has many rocky outcrops but it is not difficult to find a route through these. If returning via Cruach Ardrain do not attempt an early descent into Coire Earb, but ascend the ridge to regain the path to Grey Height. Top of Beinn Tulaichean with Cruach Adrain behind. April 2005. 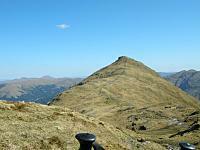 The summary information of one or more ascent routes that include Beinn Tulaichean. 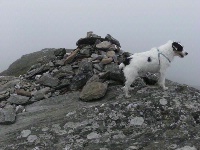 Billy at the top of Beinn Tulaichean. 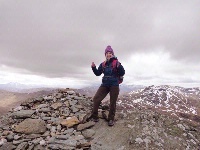 Post a few words about Beinn Tulaichean or read what others have had to say. climb these from the South. bit of a winding drive down there but a great walker friendly car park at the end of it (Balquhidder). steep but simple and quick ascent on to the Beinn good path to Cruach Ardrain and then a really nice easy bouncy descent back to the glen and onto the track. you can even buy venison at the farm on your way back to the car a much shorter day than from the other side. misses out the river crossing and generally less boggy! I chose to ignore the recommendation of the Munro "bible" and instead walked about 3k from the car park along the farm track until I was directly north of the col between Beinn Tulaichean and Cruach Ardrain. This shortened but, of course, steepened the generally grassy sloped climb up to the col which, when reached, gives the choice of going "left to Beinn T or "right" to Cruach Ardrain. Both were easy climbs to their respective summits in what was a glorious summer's day. The return journey retraced the earlier steps. Tough wet going up slopes from Inverlochlarig. Thick cloud and driving rain by time of reaching the gate in the fence. Heading for the obvious break in the crags stumbled upon a faint path(rill in places) that goes over the crags, broad top and past rocky formations to the summit. Abandoned idea of Cruach Ardrain. Easier to follow this faint path in descent but beyond the gate it disappears above some barely visisible tree tops. This is very steep ground avoidable on either side. Note the two huge split rocks at rhe bottom -one topped by heather -the other apparently split by a rowan. Climbed with Sandy Reid on Sun 5/7/09, a warm summer's day. 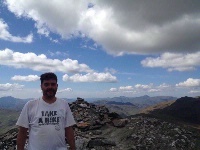 2 hrs got us to the top, leaving a large party of novice-walker, smoking policewomen an hour behind us. Nobody shouted "Stop, thief!" but it would have been tempting. Returning fm C Ardrain dropped R to steep wild glen rather than L to the Landrover track. No path and great exploratory feel. Unfortunately no pools deep enough for swimming but stopped for an alfresco shandy at Monachyle Mhor Hotel amd watched the red Lomond Seaplane (custom reg no G-WATR) land on Loch Voil - wonderful way to get to the pub on a drowsy Sunday afternoon.